Chart-topper Annie Lennox has said that pop stars who did not use their fame to promote good causes were missing an opportunity. The former Eurythmics singer and HIV awareness campaigner said that artistes should not “necessarily” use their elevated status to champion worthy causes. The singer said that choosing to make a difference was her ­“calling”. Ms Lennox is of the same generation of 1980s pop stars such as Bob Geldof, Midge Ure and Bono who promoted humanitarian causes. She said today’s celebrity-fixated culture made her “a little sad”. In recent years she has established The Sing Campaign to raise awareness of HIV and is an ambassador for many international organisations on the issue. She confirmed yesterday that she would be visiting Malawi in February with former First Minister Jack McConnell in her role as special envoy to the Scottish Branch of the Commonwealth Parliamentary Association (CPA). Despite her role with the Scottish Parliament and also hailing from Aberdeen, Ms Lennox does not back independence for Scotland. Ms Lennox added that balance was required, otherwise “you could take a fierce independent pride and nationalism and it could tip too much the other way”. The star said that the current court case in Germany involving HIV positive pop star Nadja Benaissa, who is accused of grievous bodily harm for allegedly infecting one man, was a “dark story” but that a positive message could be found. Ms Lennox, who lives in London and has two teenage daughters, estimates she splits her time evenly between singing and humanitarian work. She said: “I want to contribute to changing the perception of HIV, I want people to know that it’s the biggest killer of women of reproductive age globally. Ms Lennox remained tight-lipped about current musical projects, but said she would be talking more about them in a few months’ time. She added: “There’s all kinds of lives I could live. I’ve made a bob or two. But it’s about my values, what I do with my time, my focus. 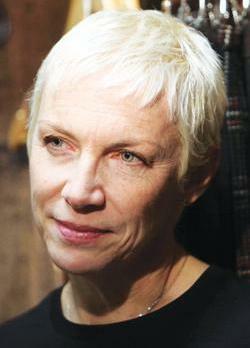 Ms Lennox formed Eurythmics with Dave Stewart in 1980. They were one of the biggest British music acts of the 1980s, selling an estimated 75 million records worldwide and scoring hits such as the 1985 number one, There Must Be An Angel.